The perfect ring set for the fashionista! This midi ring set consists of 5 thin rings in the color gold. You can wear the ring on top of your fingers. Mix and match it with other gold colored rings. Do not forget to put your favorite color nail polish on. Finish your look with a gold layered necklace with crystal stones. ???? 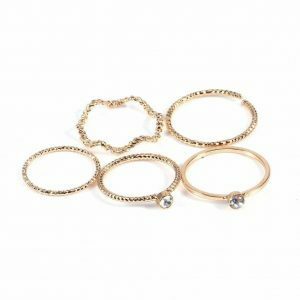 Do you have any questions about the 5 pieces gold midi ring set? Send us a message.